1. The color temperature is for white light. 2. White light can be divided into three categories, namely warm white light, white light, and cool white light. 3. Warm white light is low color temperature light. There is orange in white light, and the more orange, the lower the color temperature. 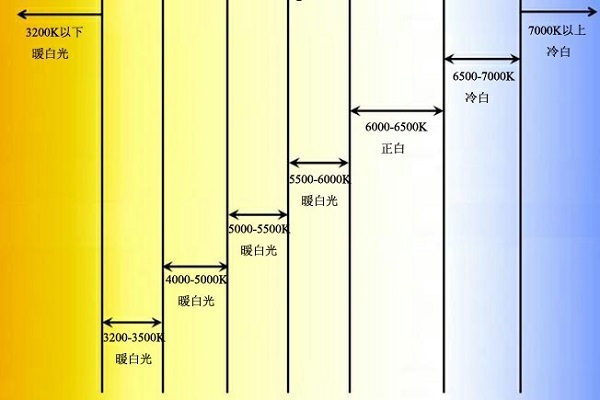 The current light source is 2700K, 3000K, 3200K, and the home uses 2700K more, which is a feeling of yellowish light. The stage performances are more 3000K and 3200K. They are low-color warm light and warm white light. They are used as white light on stage. 4. White light rarely appears in life. In the morning and afternoon, when the warm light turns into cold light and the cold light turns into warm light, pure white light appears. LED light source has a relatively pure white light, the color temperature is about 4500K-5000K, in addition to LED, there is no other light source has a relatively pure white light, not warmer or colder. 5. 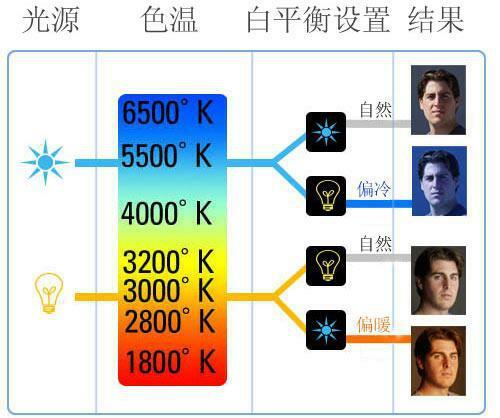 Cool white light is high color warm light, white light has blue, the more blue the color temperature is higher. Now there are 5600K, 6000K and 7000K in the light source. The higher the color temperature, the less adaptive the vision is. Therefore, some beam lights take light with a high color temperature, which is more stimulating to the visual effect and achieves a strong and obvious effect! 6. Remember the light of these two color temperatures: 3200K and 5600K. 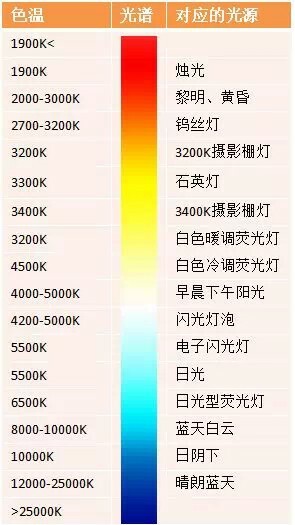 The color temperature of 5600K is the direct light of noon in the natural world where the sun is not blocked by clouds. The light used in film and television shooting is the two color temperature lights, that is, the low color temperature is 3200K, and the high color temperature is 5600K. Generally, high color temperature is used during the day and low color temperature is used at night. These two color temperature lights can't be used together in normal shooting! 7. Whitening balance is the adjustment in photographic photography, that is, white light with color tendency is adjusted into pure white light in the photographic camera, then the original color of the object can be restored when the object is shot! 1. This is the single point of white light. 2. Under the illumination of white light, the object can show the original color of the object itself. 3. The white light we use now is not very pure white light, so we can't show the object color 100%. Compared with warm white light, the white color index of warm white light is higher. 4. The color rendering index of light can reach above 95. It is a light with high indexing. It is suitable for the front white light illumination used in the performance. 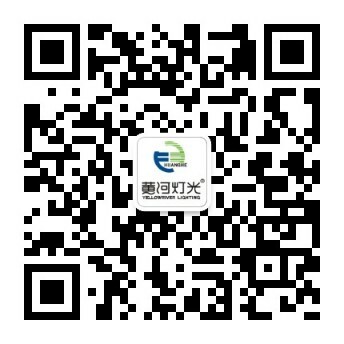 It is suitable for night illumination in people's daily life. There are also light with low color rendering, such as street lights. 5. Previously produced LED light color rendering index is very low, and now has a color rendering index of 90 and 95! 1. Each lamp has its brightness at its power, but this is not a certain brightness value. 2. It is difficult for the light source to illuminate all of its light in one direction in the luminaire, and more or less wasted light when the tissue is optically projected. How can we waste less light? This requires an increase in the utilization of light, that is, the same power source has different brightness, of course, the same power source, its high brightness lamps are good, and more popular with users! 3. Lamps of different brightness have different uses. 4. The light and darkness of light are positioned in contrast to each other. The lights are not absolutely bright, nor are they absolutely dark! 下一页：Do you feel the dream effect of the stage laser light?